Spring 2014 Bell RS-1 Graphics - Something for Everyone! At this point, we all know the Bell RS-1 and how it performs on the street and on the track. As a high-performance midpoint helmet, it is composed of a lightweight fiber composite shell, has excellent airflow, and outstanding aerodynamics. The sweat-wicking material used for the liner and cheekpads has been proven to remain fresh in-between washes... Enough about the helmet’s performance. Let’s talk about graphics. After all, you’ve got to look good on that bike, right!? 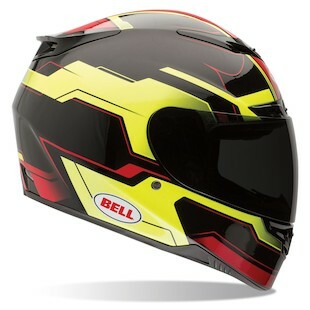 For 2014, Bell will be releasing several new graphics for both the dare-devils and the safety-conscious alike. 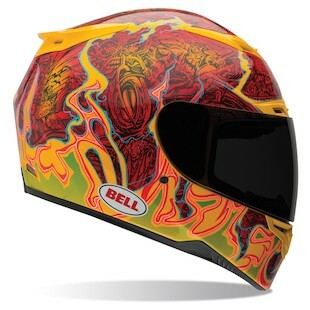 Leading the charge, the Bell RS-1 Airtrix Meltdown graphic has fire flames engulfing the scenery. Look closer, and you will notice evil monsters riding their two-wheeled, octane-chugging beasts as they try to escape the depths of hell. The red, the yellow, and the orange blend together to represent an image that some might find uncomfortable. Viewer discretion is advised. 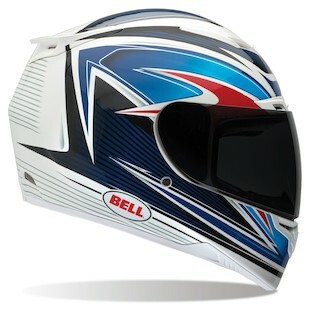 The Bell RS-1 Liner graphic is available in two colors. There is a matte black and hi viz stripped option for the safety- oriented, which somewhat reminds me of a competitor’s Glacier model. There is also a white and black stripe version that would look great on the new Panigale 899. The Bell RS-1 Servo graphic reaches out to the track crowd or simply the aggressive rider who likes a more detailed, racy graphic. The white and gray version is a safe bet for anyone, but the red, white, and blue will not only represent the great colors in this great American nation’s flag, but it will also match your Gixxer or your S1000RR. 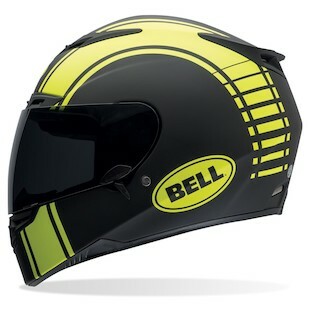 Last, but not least, the Bell RS-1 Speed Hi-Viz graphic steals the lines from Tron and the colors from Iron Man, to become a hi viz option that will not only keep you visible, but might scare granny in her ‘99 DeVille off the road. Be careful. Do not tailgate with this one. As the baby brother of the Bell Star, the RS-1 will perform to the highest of expectations. There is no question that it will look good too. Just beware of cagers who might find you distracting.